Family Volunteer Day is a day of service that demonstrates and celebrates the power of families who volunteer together, supporting their neighborhoods, communities and the world. Created by Points of Light in 1991, Family Volunteer Day is held annually the Saturday before Thanksgiving to ‘kick off’ the holiday season with giving and service, and to signal the start of National Family Week. We’re excited to announce that VolunteerConnectDC.org has a fresh new look and is now mobile friendly. The new site is easy to navigate and includes volunteer highlights, a gallery, and an organization directory, along with latest news and blog postings. Enjoy improvements to the “Search Volunteer Opportunities” page and find the perfect match. Take a tour of the new site on your computer, cell phone or tablet! Your feedback and suggestions are always welcome – simply contact us from the main menu. 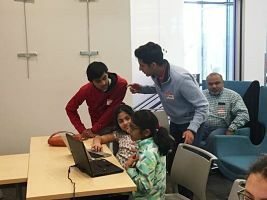 Volunteer Connect was recently featured in the Douglas County News Press for their outstanding work in the community. Read the full article Here. National Make a Difference Day is an annual community service event which is held on the fourth Saturday in October. Join many volunteers across the country on October 28 with a common mission to improve the lives of others through community service.